1,001 Celestial Wonders is a guide to the night sky's brightest and most fascinating objects. Each target is accessible to amateur astronomers using medium-sized telescopes from a dark site. In fact, many are so bright they remain visible under moderate light pollution, as from the outskirts of a city or the suburbs of a town. The book provides a chronological target list, making it easy to use. N… o matter what night you choose, this book will show you many of the most memorable objects to observe, whether you are using a small telescope or even binoculars, or an instrument of larger aperture. This is far more than just a list of interesting objects. It is structured so that objects of various observing difficulty are included, which will help readers become better observers, both encouraging beginners and challenging long-time amateur astronomers. This book is designed to be easy-to-use at the telescope, and observers will appreciate each object's standardized layout and the book's chronological organization. Finally, many amateur astronomers function best when presented with a list! Even the Meade Autostar controller features a 'best tonight' list (although the list is far less comprehensive and detailed than the catalog provided in this book), a feature that has proved extremely popular. 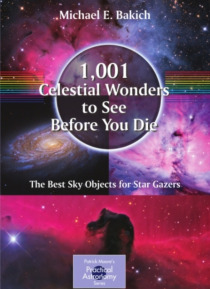 1,001 Celestial Wonders offers a life-list of objects any observer would be proud to complete.